Researchers from the Korea Advanced Institute of Science and Technology (KAIST) say that Graphene can be used to create bendable batteries. 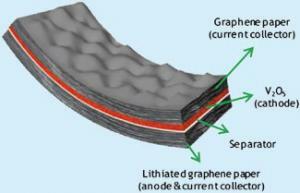 The researchers developed a graphene-based hybrid electrode and produced a flexible lithium rechargeable battery. The cathode material (V2O5) was grown on a graphene sheet using pulsed laser reposition and the anode was lithium-coated graphene. This battery actually has promising performance compared to non-flexible batteries - higher energy density, power density and better cycle life. The team now works on extending the performance using solid-state or polymer electrolyte. They also believe that this technology can be used not just in batteries but also in solar cells, OLED displays and catalysis.